Besides investing in yourself, there is one way in particular that has the greatest chance of making you the most money for the least amount of risk possible. The idea, as it is known in the investment community, is asset allocation. The purpose of asset allocation is to choose a particular mixture of assets (i.e. stocks, bonds, etc.) to get the greatest return per unit risk (i.e. most bang for your buck). Many great investors have discussed the important of asset allocation for boosting returns while minimizing risk. David Swensen, the Chief Investment Officer for Yale, pioneered an approach for endowment investing based on proper asset allocation that has made him famous in the investing community. In addition, my favorite investment writer, William Bernstein, covers this topic in great detail in The Intelligent Asset Allocator. But don’t take their word for it, let’s dig into the data to see asset allocation at work. The x-axis is our level of risk and the y-axis is our level of return. 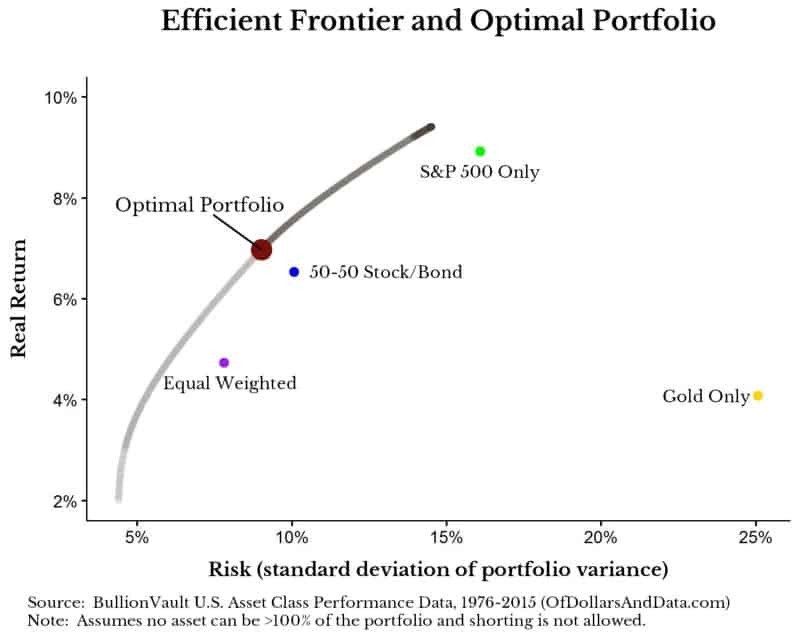 The gray to black line represents something called the efficient frontier, which is the location along which a particular mixture of assets would be optimal for that level of risk and return. Imagine this as the “best of all possible worlds” given the assets you can choose from. The large red dot represents the optimal portfolio, or the point at which you get the most reward per unit of risk. In addition you will see other points labeled along the plot which represent other example portfolios that I included for comparison. I know this is a lot to take in, but the key point is that it is better for you to move upward and to the left on this plot. You also can’t go above the efficient frontier with this particular set of assets over this time period. 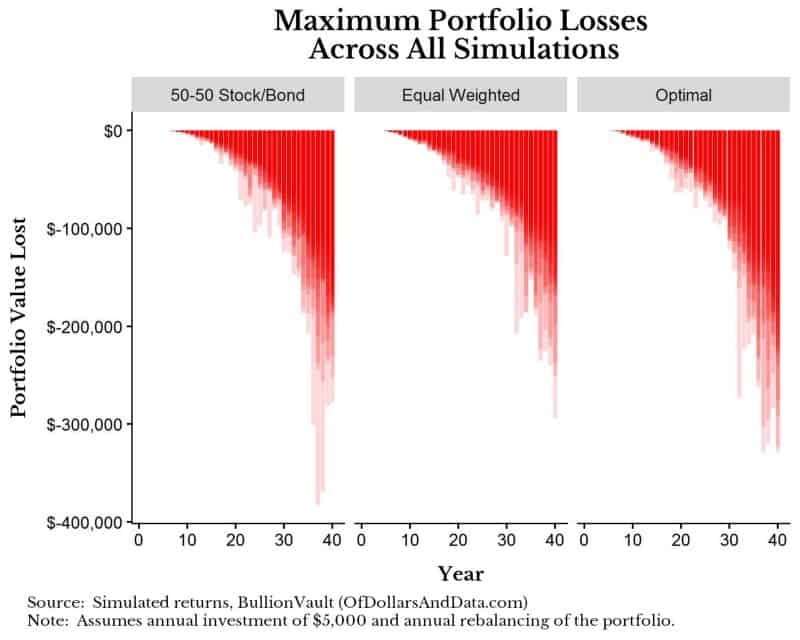 Additionally, the example portfolios shown above were selected to demonstrate how many conventional portfolios would either have more risk for less return, or more return and more risk than the optimal portfolio. 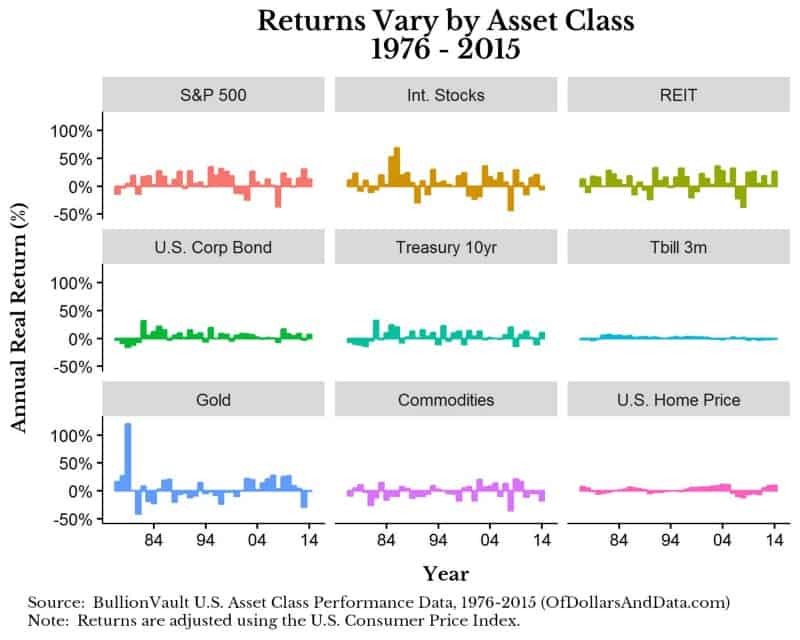 In particular, “Gold Only” has the most risk of any asset class, yet it’s real returns are not great. You may assume that this means you should never buy gold…but wait for the punchline. 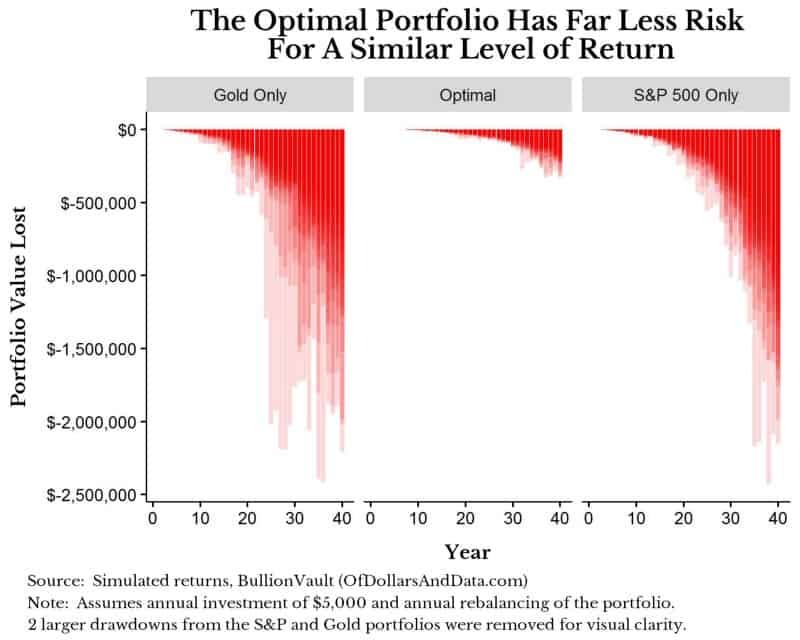 The most surprising thing about the optimal portfolio is that it contains 10% gold. How can this be true given that gold has such high risk and such a low return? This is where the solver beats conventional intuition. The reason gold, despite its individual shortcomings, can play a role in a portfolio is because it is less correlated with the other assets. When stocks and bonds go zig, gold goes zag. And that relationship makes it optimal to hold gold in this scenario. Another surprising insight is the assets that are not in the optimal portfolio, namely, commodities, U.S. corporate bonds, and U.S. homes. Ironically, most U.S. households tend to have too much of their net worth in their home (their primary asset), and this solver recommends not even owning a home as an investment! Then again, these results are probably biased based on the time period, but that is what this data suggests. Now that you know what is in the optimal portfolio I want to show you how this thing performs. All you have done is look. Now it’s time for a test drive. 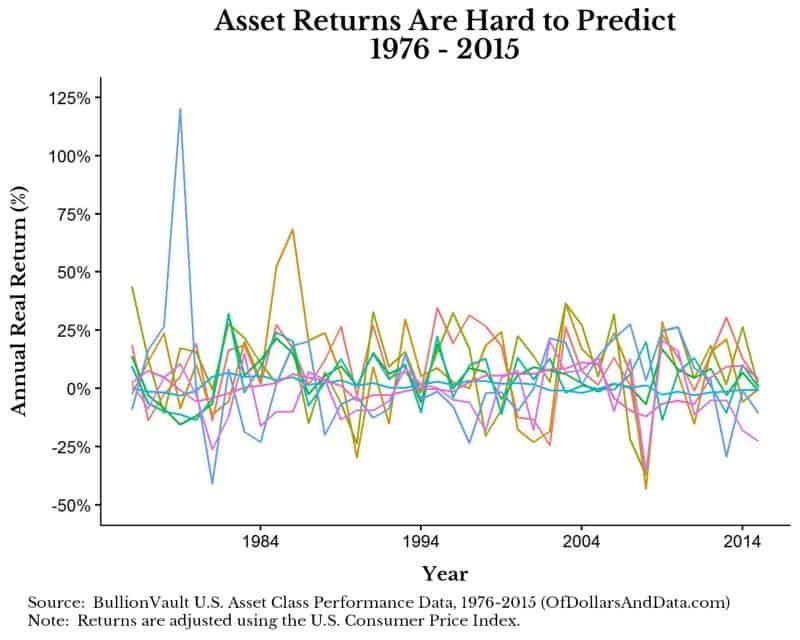 To do this “test drive” I simulated historical returns using the 40 years of data I had (sampled with replacement) and then ran all of these portfolios through 1,000 simulations of a 40 year investment period. In the simulations I contribute $5,000 at the beginning of each year and rebalance my portfolio annually. Finally I calculated something called the maximum drawdown for each of the simulations. A drawdown is the difference between your maximum portfolio value (up to that point in time) and your current portfolio value. Let’s say you have $100,000 and lose $10,000 over 1 year. The current drawdown would be $10,000. Let’s say another year goes by and you lose another $5,000. Now your drawdown is $15,000 as this is the difference between your maximum value of $100,000 (2 years prior) and your current portfolio value of $85,000. Let’s say in the next year you earn $14,000 bringing you to $99,000. This is still a drawdown of $1,000. 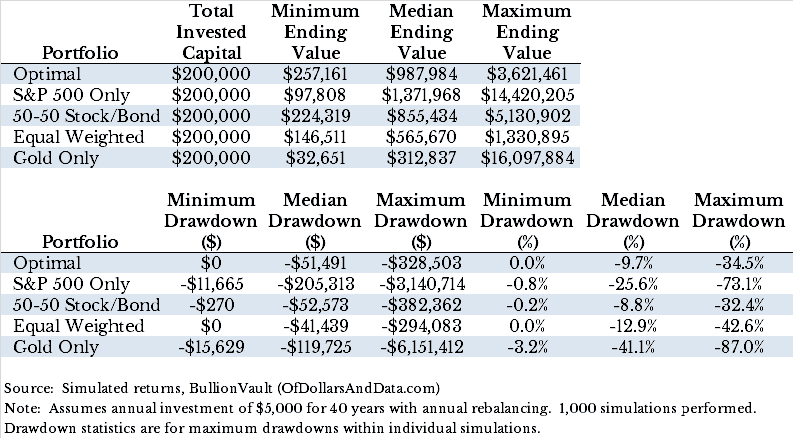 Once you go above $100,000, your maximum is reset and your drawdown goes to $0. In this example, the maximum drawdown was -$15,000 or (-15%) as this was the most money you ever lost from your peak. Looking at the portfolios above you will notice a few things. First, only the S&P 500 portfolio is expected to outperform the optimal portfolio over a 40 year period as it has a “Median Ending Value” of ~$1.4 million compared to ~$1 million for the optimal portfolio. However, that same portfolio will have much larger drawdowns over its investment lifetime (-25.6% vs -9.7%). So though you will likely get richer buying only the S&P 500, you will sleep a lot better with the optimal portfolio. So…Where Should You Invest When You’re Investing? 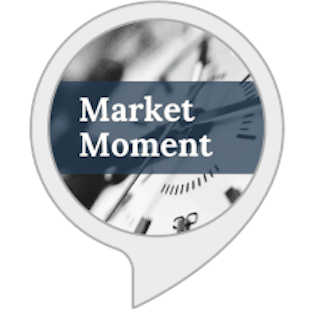 Firstly, no one knows where the markets are going, so I cannot tell you which exact portfolio will perform the best over the next few decades. However, I can say with reasonable certainty that you should buy a diverse set of asset classes while paying the least amount of fees possible. The exact mix of those asset classes will depend on your goals, risk tolerance, and current financial standing. 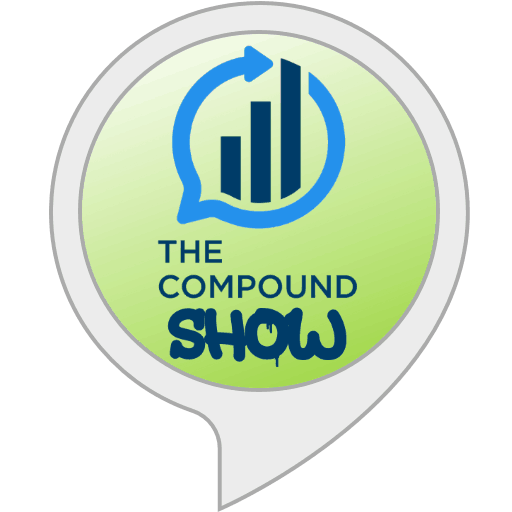 The nice thing about asset allocation is that it is doable with as little as $1,000 because you can buy Vanguard or Charles Schwab funds through each of their respective brokerage services without paying a commission. Lastly, I have a bunch of Thank Yous for this post. 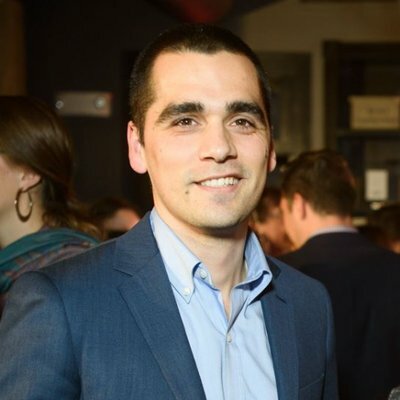 Thank you to Andrew Matuszak for his post on the R portfolio optimization here. Thank you to my friend Tyler Danzey for coming up with the title of this post. Thank you to BullionVault for providing their data. And lastly, thank you for reading!